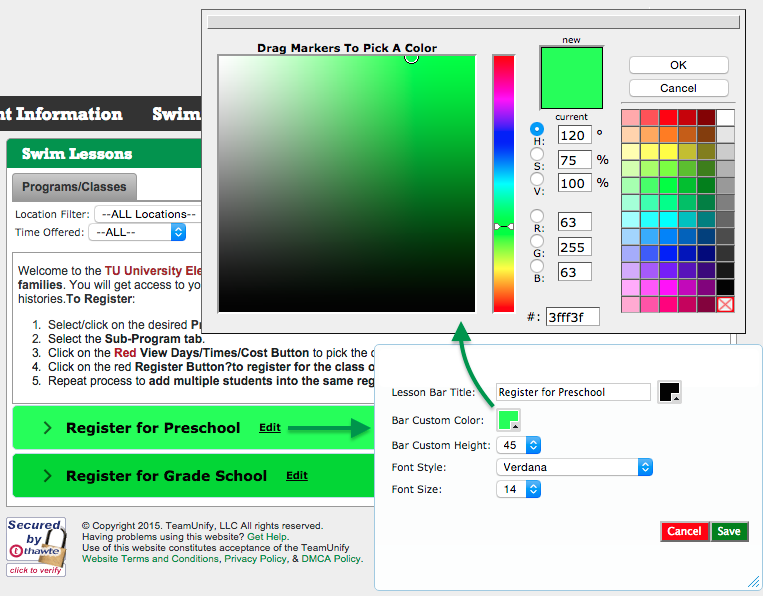 On the Lessons signup page you can customize the color, font, and size of the registration bar(s) at the bottom to make them as blatant or subtle as you need. This is helpful when there is a lot of text on the page. There are two ways you can customize them. In the side menu click System > Swim Lessons (or whatever you labeled it). Click Edit on the bar at the bottom you wish to change. Change the properties you want. The color picker by the Lesson Bar Title changes the color of the text. You may need to drag the color picker window at the top to move it to see it all. We recommend high contrast colors for the text vs. the bar color to keep it readable. In the second row of tabs click Program. Click a Program name (not the check box). Note the Lesson Bar Title (what the users see) can be different than the Program Title. Follow the same guidelines as above. You can customize each bar, but take care to keep them attractive by either being consistent with each one or choosing complementary colors. Someone with graphic design knowledge can help. What is a Program / Subprogram / Class?